When I was a young man I was told by a specialist that I could never pursue my chosen métier of couturier because I was far too delicate. Nobody knows what a tough métier it is, how gruelling the work is. Underneath all this luxury and glamour, the truth is, it’s a dog’s life! Cristóbal Balenciaga opened his heart in this telling way during an interview held in his home in Paris in 1971 with the journalist Prudence Glynn. The article, which included some secrets revealed to the fortunate journalist by the now retired couturier, was published in the British newspaper The Times, on August 3 of that same year. The prestigious newspaper headlined the information on the front page and presented it as a world exclusive on page 6, just above the international section and several articles of political relevance. The second and last interview Balenciaga granted the press (the first was published on the occasion of his retirement in August 1968 by the French magazine Paris Match) was placed between articles on the United States’ secret war in Laos, the absence of Romania at the Crimean summit and the strength of Catholicism in Communist Lithuania. Balenciaga evoked distant memories, events so far removed from grand ovations, overwhelming reviews and devout clients; in short, from the resounding success in the trade he had decided on when he was barely a teenager. The interview revived memories of his youth, his beginning and his hopes, and offered glimpses of the view of a retired man at the end of his career, looking back to take stock of his life. His words showed no bitterness or regrets, but a profound reverence for work, perseverance and tenacity – which made him one of the greatest and most acclaimed fashion designers of the 20th century. Despite his fame, Balenciaga always remembered Getaria, his mother and his old sewing machine. A view of Vista Ona by the Marquess of Casa Torres, around 1890. © Casa Torres Funtsa/Getariako Udala. 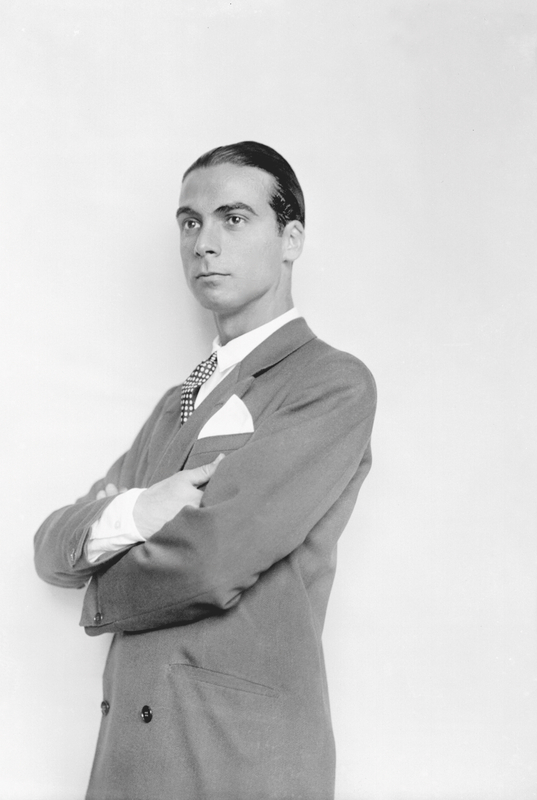 Cristóbal Balenciaga Eizaguirre was born in Getaria on January 21, 1895, in a humble house at Calle Zacayo number 10. He was the youngest of five children born to José Balenciaga Basurto and Martina Eizaguirre Embil, two of whom died during childhood before Cristóbal was born. His father was a mariner and his mother a seamstress, and both worked with determination to provide for their young family. Regrettably, José died suddenly in 1906, leaving his widow alone in the hard task of ensuring the well-being of their children. Cristóbal was only 11 years old. His two siblings, Agustina and Juan, were old enough to contribute to the family income, but Martina had to intensify her work. In addition to the orders from some prominent families in the area, she started to give sewing lessons in her home to the young women of the town. Young Cristóbal sewed his first stitches with his mother before settling in San Sebastián as an apprentice in one of the reputable tailor’s shops in the Gipuzkoan capital. At a cursory glance, the environment that surrounded Cristóbal Balenciaga in his hometown of Getaria did not seem very appropriate for training a child and introducing him into the sophisticated world of haute couture; however, it is rather complex and interesting. The truth is that Cristóbal experienced some exceptional circumstances in childhood that involved his parents and the relationships that came from their respective jobs. He got in touch with the refinement and the taste of the privileged classes in a natural way and at an early age. This would make a decisive mark on his personality and his creative genius. José Balenciaga was a mariner, just like most men in Getaria, and he was mayor of the town on two occasions, after being elected by the Liberal Party in the local elections of 1895 and 1897, respectively. In 1901, he was appointed skipper of the Guipuzcoana, a small boat with a shallow draft that belonged to the State and which was dedicated to customs surveillance from its base in Getaria. Nevertheless, beyond fighting the extensive smuggling activities, the boat also carried out auxiliary duties for the Royal Family during the summer vacation of its main members in San Sebastián. As a result, the Guipuzcoana would ferry Queen Maria Cristina and her children, as well as other members of the Royal Family, the Court and the Government, on their numerous formal outings, leisure trips and excursions. That allowed José Balenciaga to establish a close and familiar relationship with the cream of the aristocratic and political elite. of artistic and sartorial cultivation that was so different from his daily reality in Getaria. Studio portrait of María Micaela Elio and Magallón, Dowager Marchioness of Casa Torres, around 1880. She was admired for her beauty and elegance. © Casa Torres Funtsa/Getariako Udala. Blanca Carrillo de Albornoz y Elio, Marchioness of Casa Torres, was, in all probability, the best and most demanding client of Martina Eizaguirre, for her formidable spending power, her exquisite taste and the quality of her vast wardrobe. Martina began to work for the Marchioness before the birth of Cristóbal in 1895, shortly after the Marquises settled in their residence in Getaria. 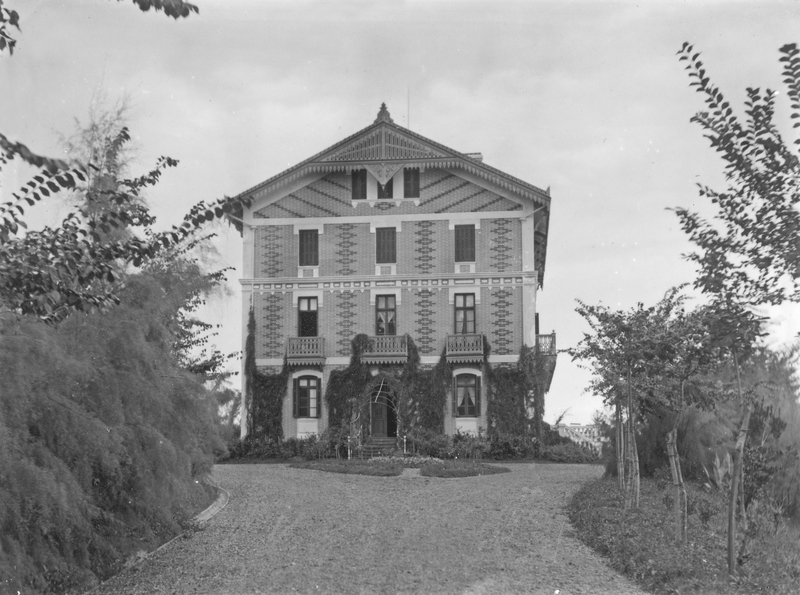 The villa, called Vista Ona, which now houses the Balenciaga Museum, belonged to the Marquis’ consort, Cesáreo Aragón y Barroeta Aldamar. Born into a rich and illustrious family, Cesáreo was the grandson of Joaquín Barroeta Aldamar y Hurtado de Mendoza, a well-known liberal politician born in Getaria in 1796 and supporter of the legal code, or fueros, embracing Basque customs and practices. He was senator and first President of the Provincial Council of Gipuzkoa. Like his maternal grandfather, Cesáreo entered politics and administrative management. Thanks to his position and excellent training, he was chosen to be member of Parliament in 1894 and senator for Gipuzkoa in 1903. Blanca inherited the Marquisate of Casa Torres from her Cuban father and on her mother’s side, came from an aristocratic family settled in Navarre, descendants of the Mendoza family. Her mother, Doña Micaela Elio y Magallón, was the daughter of Don Fausto Elio y Mencos, seventh Marquis of Vessolla, eighth Count of Ayanz and Viscount of Val de Erro. The family was, therefore, in a privileged position and was closely related to the aristocracy, politics and the most intimate circles of the Court. These relationships intensified during the summer months, when San Sebastián and the Basque coast became the political, social and cultural center of the kingdom. The intense social life imposed by the relational habits of the 19th-century elite, as well as the elegance and distinction that their meetings required, obliged the Marquis and the Marchioness to pay special attention to the image that they projected, through both their physical presence and the decoration of their residences in Madrid and Getaria. Together with the widowed Marchioness (Blanca’s mother), they regularly travelled to London and Paris, where they would acquire impeccably cut garments from the most famous tailors, as well as exquisite toilettes in the houses of the great couturiers of the time. Henry Creed, O’Rossen, Jeanne Hallée and Worth are just some of the names that customarily appeared on their countless invoices and account books. They were also loyal clients of the department stores that had proliferated since the mid-19th century in the main European capitals. Thus, they equipped themselves with the best fabrics, garments and accessories for their family and home. As important for the Marchioness as acquiring her phenomenal wardrobe was keeping it up to date and in good condition. For this reason, she sought the services of a rigorous and efficient seamstress who could guarantee the peak condition of all of her garments. Martina Eizaguirre did all types of sewing for the Marchioness of Casa Torres, from simple repairs, alterations and transformations to creating basic garments. Magnificent evening dresses, impeccably cut tailored suits, fabrics of extraordinary quality and fantastic adornments passed through her hands and her sewing machine. Her young son, who spent long hours helping her, learned the highest-quality sewing first hand – without a doubt, the best way to begin his lifelong trade. However, this was not enough for the perseverant Cristóbal. The Dowager Marchioness of Casa Torres, Blanca’s mother Micaela, fascinated him every Sunday when she got out of her carriage to go to mass dressed in the sophisticated designs she bought on her regular trips to Paris. Emboldened by a precocious passion for the profession, the young Cristóbal approached the elegant lady with the sole aim of getting to know more of her wardrobe. 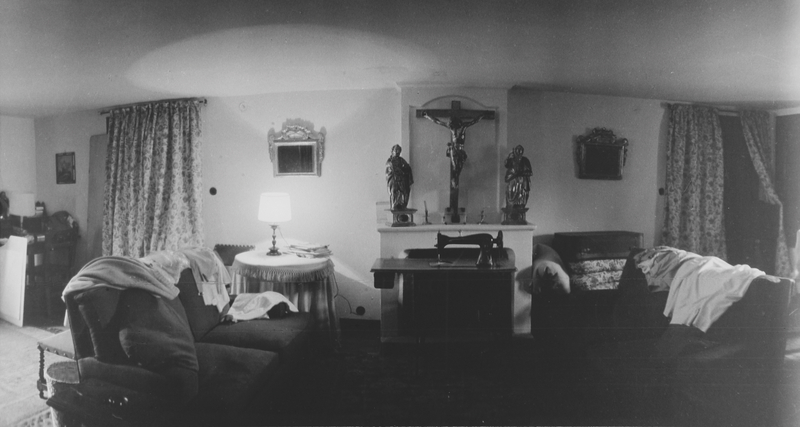 She consented and, as Balenciaga himself related at the end of his life, every day after school for months he would go to Vista Ona, where on the top floor of the villa and in the company of the women who took care of this exquisite wardrobe, he would examine every detail of the sophisticated designs. Cristóbal was only twelve years old when he found the courage to suggest to such an elegant and aristocratic lady that he could copy the Parisian model she was wearing at the time. Surprised and intrigued, she agreed to let him try providing him with all necessary fabrics and tools. So successful must this complicated undertaking have been that the Marchioness offered to sponsor the budding couturier and help him embark on his career in the fashion world. It was the beginning of a long, hard and productive path. to collect historical garments and fabrics, which gave him countless ideas for his own work. Years later they became part of the collection at the Musée de la Mode et du Costume in Paris. It was in Getaria, when still a boy, that Balenciaga captured the aesthetic taste of the Marchioness’s collections of engravings and fashion magazines and their value as a source of learning and inspiration. Cristóbal Balenciaga kept his mother’s sewing machine, probably the first one he ever used, in a prominent spot by the living room mantelpiece at his house in Igeldo. Gyenes Funtsa, © Biblioteca Nacional de España. as Piccadilly, The Popular Tailor, The English Tailor, José Sigüenza and Casa Gómez. 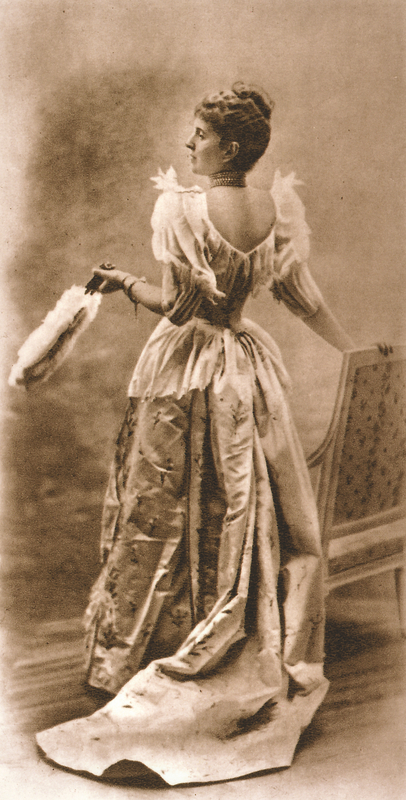 As a regular client, the Marchioness of Casa Torres was in a good position to recommend the young boy, who had proven an early aptitude for couture. Thus, Balenciaga began to work as an apprentice at the well-known Casa Gómez, located at Alameda del Boulevard number 13. This illustrious establishment frequently advertised in newspapers and magazines as “the most important tailors, preferred by the distinguished public”, and the chronicles of San Sebastián said that it was “the womb from where most of the tailors established in San Sebastián came”. After little more than a year, Balenciaga decided to continue his training in the New England tailor’s shop, a new establishment founded by Messrs Romeo, Quemada and Villar, three of the best tailors from Casa Gómez, which opened its doors to the public on March 13, 1908. The entrepreneurial tailors had no doubts about using the services of this outstanding apprentice to start up their new and ambitious commercial business. Cristóbal Balenciaga photographed in Paris by Boris Lipnitzki in 1927. © Roger Viollet/Cordon Press. of Paris. Balenciaga then left his job in the department store and moved to Bordeaux, where he worked in the fashion establishment of some friends that he met during his travels to Paris. At the same time, he perfected his knowledge of the French language, which was essential to moving in the world of fashion and haute couture as he wished. Once he accomplished his mission, Balenciaga returned to San Sebastián at the height of the political conflict in Europe, full of hope, ideas and a large dose of motivation. a couturier at an extremely opportune time for luxury commerce in San Sebastián. The First World War had impelled aristocrats, artists and wealthy businessmen to seek refuge in their summer residences in Biarritz. There they could escape from the horrors of war by devoting themselves to a life of escapism, pleasure and, above all, consumerism. The effects of the war were soon felt on both sides of the border and, almost immediately, a microclimate of luxury emerged. Many knew how to use this to their advantage. Between July and September 1917, while Balenciaga worked to establish himself on his own, some of the most famous fashion houses from Paris presented their collections for the new season in the hotels of the city or in the luxurious establishments which they rented for that purpose in San Sebastián. The Callot house from Paris, which began its season of shows in the Hotel Continental in July, was followed by Paquin, at Calle San Martín number 50; Worth, at Calle San Bartolomé number 7; Louise Rasinangue, on Calle Prim; and Chanel, who, with a modest advert, informed her clients at the end of September that “the Gabrielle Chanel house, rue Cambon, 21, Paris, which currently has its showroom in the María Cristina Hotel, has the honor of announcing to its numerous clients that (…) it will leave on the 28th of this month”. Balenciaga would attend with enthusiasm to contemplate the latest trends from Paris, at a time when he was particularly avid for ideas and inspiration. This way he got to know clients, buyers, suppliers and even, on occasion, the couturiers themselves. the contacts that this respectable Jesuit had in the Casino, but he managed to get them to let the young Balenciaga inside, but not without first warning him of the dangers of that “dubious woman”. The meeting finally took place, and a meaningful relationship of friendship and mutual admiration began that would last the rest of their lives. with a time of splendor in the summers of San Sebastián, where the Casino, the beaches and the horse racing track attracted an elegant and growing clientele that visited his establishment to see the new models. They came from different cities, even outside the summer season. 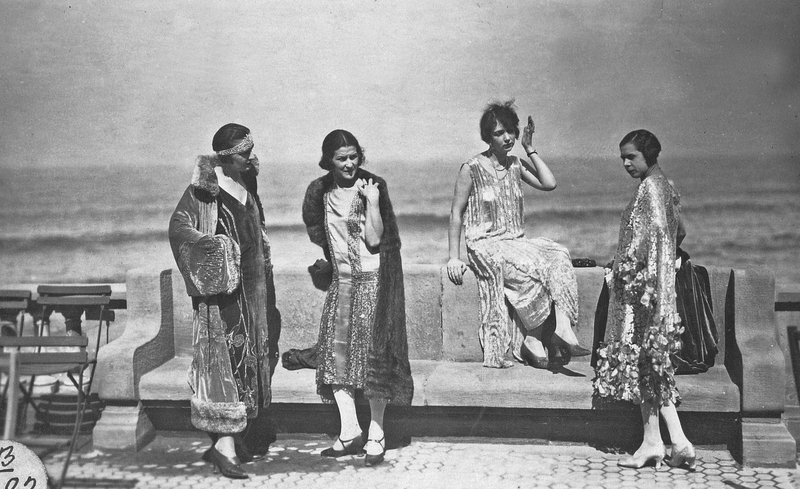 Paris models graciously pose for local photographers on the Gran Kursaal terrace dressed in designs by the most celebrated Paris couturiers of the time, around 1924. © Fototeca Kutxa. In 1924, at the end of his partnership with the Lizaso sisters, Cristóbal Balenciaga established himself alone on the first floor of Avenida de la Libertad number 2 in San Sebastián. This began what would be a new and determinative stage in his professional career. After spending a whole year searching for funding, handling paperwork and contracting staff to start up his new project, Balenciaga presented his first fashion show in the spring of 1925. The echoes of the success of his first collection attracted a distinguished clientele, among whom were Queen Maria Christina and other women from the Royal Family, such as her granddaughter, Infanta Isabel Alfonsa. 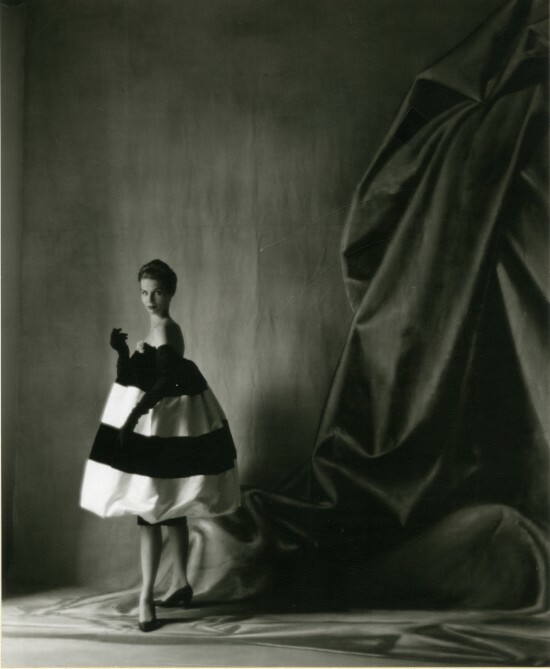 a good example of the indubitable influence of Parisian couturiers on his work, the creative independence of Balenciaga increased as his reputation as a couturier became more consolidated. The success of his collections in San Sebastián was immediate, and the news of his good work spread rapidly throughout the social circles of his enthusiastic clients. Motivated by the positive reception to his work, the couturier decided to show his collections outside of San Sebastián, in cities such as Bilbao, Oviedo or Seville, presenting himself to a clientele that he gradually conquered. At last, Balenciaga established a couture house following the model of the great couturiers of Paris. At 30 years of age, the Basque couturier finally conceived and created his own seasonal collections, organizing fashion shows with young models who showed his numbered creations in the salons on Avenida de la Libertad. He had the most exquisite clientele that he could dream of. Balenciaga was without a doubt successful in a daring gamble that began to produce his best results. this new commercial business would also reduce the number of copies of his models that many of the experienced dressmakers of the city were already making. 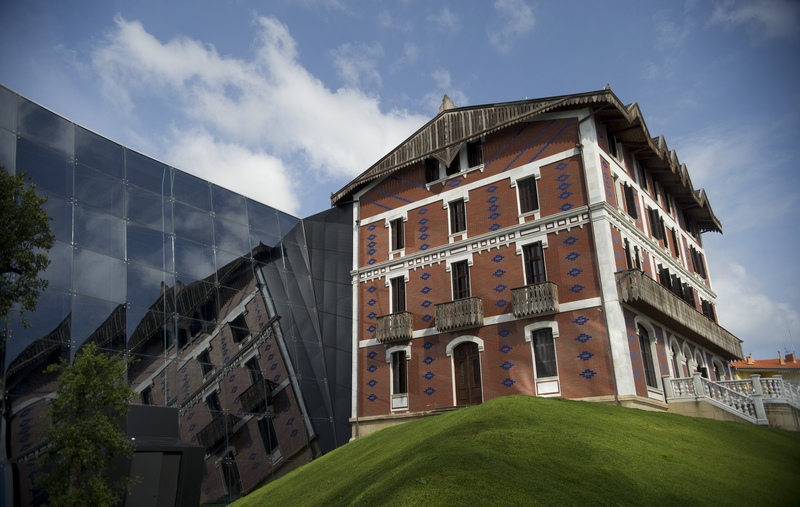 The Balenciaga Museum facilities in the village of Getaria, birthplace of the master. 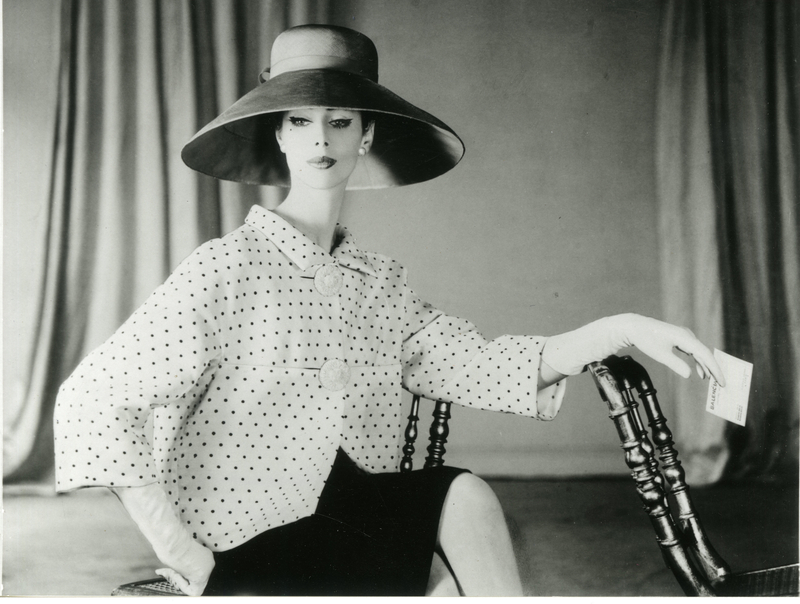 © Museo Balenciaga. the press by the time Balenciaga started working in San Sebastián. Zuloaga’s house-museum in Zumaia, where he exhibited his best work along with paintings by great masters such as Zurbarán, Goya and El Greco, would become a place of pilgrimage for the artists and intellects who were friends of the painter. Balenciaga dealt with the painter through his uncle, Julián Balenciaga, who was chaplain to the Zuloaga family, and knew his work as well as his exceptional art collection. The themes that appear in Zuloaga’s work, as well as his personal form of representing them, were interpreted by Balenciaga years later in some of his most spectacular creations. in San Sebastián and in Madrid. After the brief crisis of 1931 and the diversification of his business, Balenciaga captured the pulse of the interest and purchasing power of his clientele and saw that he could allow himself to return to the haute couture for which he felt such passion. The couturier, probably encouraged by having managed to attract new funding, decided to focus his efforts on a single establishment again, once more designing and presenting two haute couture collections a year. His businesses in San Sebastián and Madrid, by all appearances, flourished, and in 1935, encouraged by his friend and colleague Pedro Rodríguez, the couturier decided to open a third house in Barcelona, at Calle Santa Teresa number 10, in the Gracia district. From the presentation of his first Paris collection in August 1937, Balenciaga’s success was both immediate and unquestionable. Designs such as these from 1958 and 1960, placed him among the best fashion designers of all times. © Archives Balenciaga Paris. In the mid-1930s, Cristóbal Balenciaga was a couturier with a solid reputation, with outstanding commercial success and at the height of his professional maturity, both from a technical and a creative perspective. After overcoming considerable difficulties related to the political and economic situation of the country, he demonstrated great versatility and capacity for adaptation. He consolidated his business, as well as a loyal and exquisite clientele that included members of royalty, aristocrats, artists and ladies of the buoyant Basque bourgeoisie. Balenciaga also had extremely good relationships with the best couturiers, buyers and suppliers involved in the art and business of haute couture in Paris; a world that he had known well since he began in his trade twenty years earlier. For all these reasons, Balenciaga was in the ideal position to take the final leap and establish himself in Paris when the outbreak of the Spanish Civil War forced him to do so. On July 7, 1937, Cristóbal Balenciaga founded a company together with Nicolás Bizcarrondo, an engineer from San Sebastián exiled in Paris for his Republican affiliations, and Wladzio Jaworowski d’Attainville, his invaluable collaborator. The three men founded the “Balenciaga” couture house at Avenue George V number 10, where in August 1937 Balenciaga presented his first haute couture collection in Paris. From that moment on, his success never stopped. Balenciaga succeeded because, in regards to his profession, he had nothing more to learn and everything to teach. once again adopting the original name of Eisa, instead of the previously used EISA B.E. 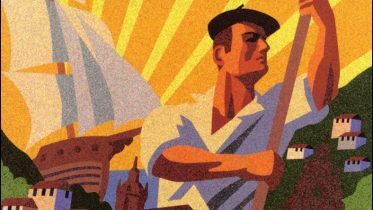 The establishments in Madrid and Barcelona adopted the new brand as they began their normal activity, when the war came to an end, in 1940 and 1942, respectively. From 1942 until 1968, the year in which Balenciaga announced his retirement, the fashion houses in San Sebastián, Madrid and Barcelona had periods of intense activity under the name EISA. They prepared the seasonal collections to be shown in the halls of the three cities coordinated with the fashion house in Paris, always under the rigorous supervision of the Master. Also from the presentation of his first Paris collection in August 1937, Balenciaga’s success was both immediate and unquestionable. Designs such as these from 1958 and 1960, placed him among the best fashion designers of all times. © Archives Balenciaga Paris. to adapt to all the circumstances, whether challenging or glorious. However, Balenciaga always aspired to perfection in couture and to the highest quality in terms of materials, and that is why he worked hard to establish his own haute couture house. The couturier opened up seven establishments between 1917 and 1936, dressing the Royal Family, the Court, European society, the bourgeoisie and the upper middle classes of San Sebastián, Madrid and Barcelona through the years. Before moving to Paris, he knew all the ins and outs of the haute couture system, as well as couturiers, suppliers, buyers and clients. He made use of it all to establish his own company. Encouraged by his own success, Balenciaga adapted to his new surroundings, creating original proposals that integrated the amalgam of ideas, themes and influences that he had known, experienced and absorbed during his years in San Sebastián. The paintings of the great Spanish masters that the Marquis of Casa Torres collected with great enthusiasm, the 18th and 19th century fashion engravings that he had seen in Vista Ona, and the work of his friend Zuloaga all had a decisive influence on his best work. that the ultimate reason for this determination to keep the three fashion houses in San Sebastián, Madrid and Barcelona active was a deep sense of fidelity and acknowledgement of his origins. All three bore the name of his mother – a tribute to his most loyal collaborator and the instigator of his devotion to a trade to which he dedicated his whole life. Note: More information of the subject can be found on the author’s previous publications: M. Arzalluz, Cristóbal Balenciaga. The Making of the Master (1895-1936), London: V&A Publications, 2011; M. Arzalluz, “The origins of a genius. The making of the Master”, in Balenciaga. Cristóbal Balenciaga Museoa, Thames & Hudson, 2011. Daniel Innerarity joins Basque Tribune. Mikel Alonso, the new addition to our Advisory Board.